Eastern Caribbean cruises are fun! There is a great mix of the Caribbean islands you may visit on your family cruise, and yet you will find similarities that are evident throughout the region. Your cruise may include a stop in the Turks and Caicos Islands, the Dominican Republic, St. Maarten (Netherland Antilles), Martinique (French Antilles), US Virgin Islands or the British Virgin Islands. You will visit a collection of islands that will serve up a delicious plate of Caribbean fun - beautiful beaches, exciting shore excursions, close-up views of exotic animals, extensive shopping and even dazzling waterfalls. Undoubtedly, your family will also notice the economic struggle of the West Indian people. Such was my family's 7 day Eastern Caribbean cruise aboard Norwegian Dawn in 2009. The Norwegian Dawn appeared to be bigger than the other ships we had sailed on, but it was not. Anyway, it was delightful to be onboard: several restaurants (multiple cuisines), multiple pools, kids' zone, teens' zone, great entertainment, and our first experience of FreeStyle Cruising. Freestyle Cruising means - not being stuck with a fixed time for dining; not having to sit at a table with non-family members every evening; choosing to enjoy a variety of cuisines; being pampered by an abundance of crew-members; dressing "however" you want (with modesty of course); and, participating or choosing not to participate in activities. Some of you will enjoy Freestyle Cruising, but others may not. Our Caribbean cruise to the east made four stops: Samana, Dominican Republic; St. Thomas, USVI; Road Town, Tortola, BVI and Nassau, Bahamas. There were two things that thrilled us about Samana. One - the natives struggled economically, but found ingenious ways to get around. The main form of transportation was by motorcycle. Interestingly, it was a common thing to see three and four people on one motorcycle negotiating the holes and bumps of the rough roads. The second exciting thing about Samana was a waterfall. We rode on a motorcycle-powered taxi about five miles from the pier and were led about 30 minutes inland from the main road. What we beheld was nature's beauty at work - water flowing from far up into the mountain, down the rocks and then forming a nice stream below. 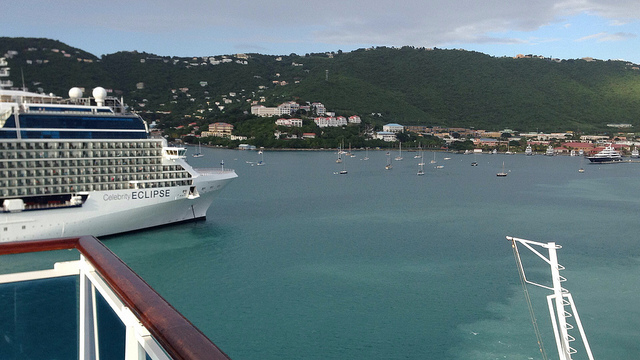 We took pictures, but unfortunately when we made our second stop in St. Thomas, we accidentally lost our camera. That was painful! Yes, that put a damper on our second stop. We were angry for a while, but then got up and toured the island. Have you seen an iguana up close? We saw several. We also had a chance to view some of the high-priced real estate of St. Thomas as well as the homes of the "poor" vs. those of the wealthy. St. Thomas has a beautiful bay area and we were able to get an eagle's view from up on a hill. 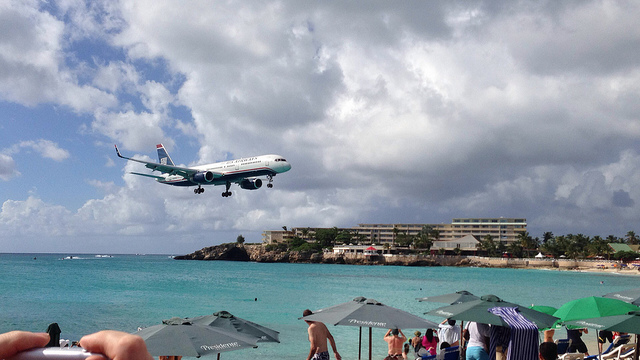 As soon as you get ashore, you come face to face with one big thing for which St. Thomas is known - shopping. This little island is known as a mega-shopping stop in the Caribbean. From St. Thomas we stopped in Road Town, Tortola, BVI and from there to Nassau, Bahamas. We did not do much in Tortola, except interact with the natives, visit the shopping areas (we learned that the vendors in Tortola actually shop in St. Thomas) and share a Tortolan meal. Our stop in Nassau meant a trip to the beach and a visit to the highly popular, Atlantis Resort. Yes, our Eastern Caribbean cruise was fun and we will readily do it all over again! 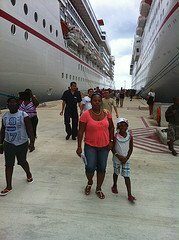 You will be excited to know that your favorite cruise line offers family cruises to the Eastern Caribbean. Generally, most, if not all Caribbean cruise lines offer 7-night Eastern Caribbean cruises. You will find at least one cruise sailing to the Eastern Caribbean out of each of the major U.S. homeports for Caribbean family cruises. Ports offering sailings to Eastern islands include: Cape Liberty, Baltimore Cruise Port, Port Canaveral, Miami Cruise Port, Fort Lauderdale, New Orleans, and Galveston Cruise Port. 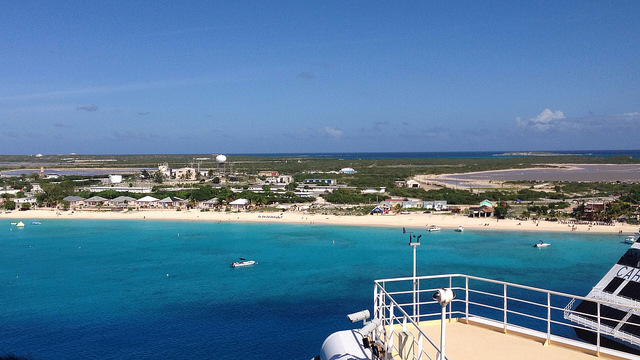 Some ports offer more year-round itineraries than others. Ports like New York, New Orleans and Galveston offer limited Eastern Caribbean cruise itineraries. What Are Some Available Eastern Caribbean Cruises? It is important to note that cruise lines constantly re-position their ships to offer the best opportunities to their returning and new guests. Therefore, I will say which ship offers cruises with Eastern Caribbean itineraries. However, I will give you a broad overview of sailings from some U.S. homeports. Carnival offers sailings which include ports of call such as San Juan, St. Thomas and Grand Turk. Carnival, Disney and Royal Caribbean offer itineraries which include such ports of call as St. Thomas, St. Maarten, St. Kitts and San Juan. Carnival, Celebrity, Holland America, Princess Cruises and Royal Caribbean offer itineraries which include such ports of call as St. Thomas, St. Maarten, St. Kitts and San Juan. 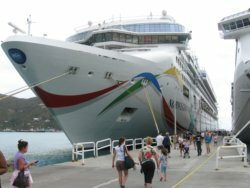 Carnival, Celebrity and Norwegian offer sailings to such ports of call as St. Thomas, Grand Turk, San Juan, and St. Maarten. 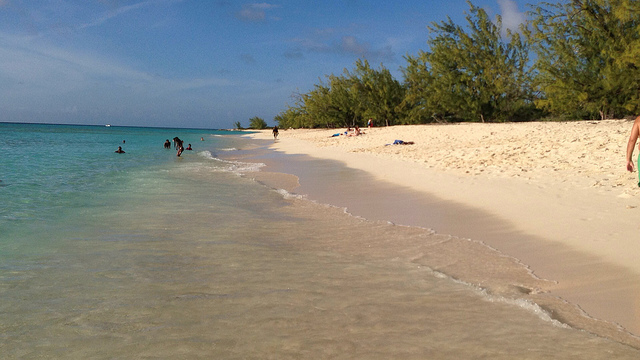 Carnival offers itineraries which include the Bahamas and Key West. Have you seen an Eastern Caribbean cruise itinerary that interests you? I believe that I have given you enough information to make that all-important decision about taking your family on a cruise vacation to the Eastern Caribbean. If we can be of further assistance, be sure to contact us. In the meantime, you go have fun on the high seas!